Most people usually use a pair of slippers or shoes to support their daily activities. It is not a rare case that most of them have to bring those things and put them in their bag or in their luggage. In this case, they may forget to bring one of those things. The possible thing that may happen is they will use the same shoes or slippers in different occasion. Another problem is sometimes it will be difficult for some people to find both slippers and shoes with affordable price because the good quality ones tends to be pricey. Based on this problem, a team of English Language Education Department (ELED) students creates an innovative slippers and shoes made into one foot wear, in the Program Kreativitas Mahasiswa (PKM-K) program. The product, SETUAN (Sepatu All in One), can be turned into sandals by lifting the fabric of striated sewage as a motive. This product becomes unique, ethnic and stylish to be worn by anyone. 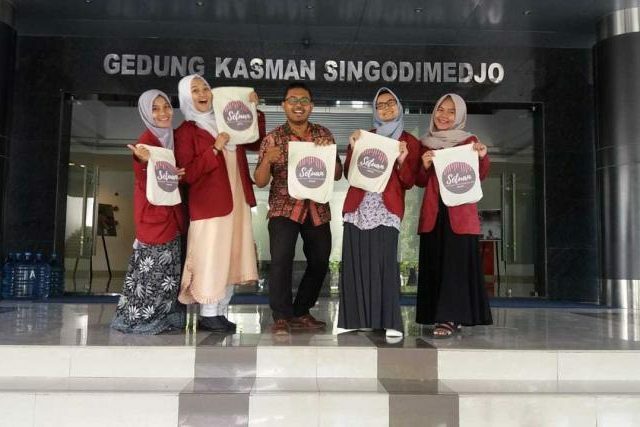 The team consists of Sayida Ralia Mawalia Z (English Language Education 2015), with the members are Oktari Firda Hibatullah (English Language Education 2015) Sri Puji Hapsari (English Language Education 2014) and Mustika Lestari (Economics 2014). “This is a very unique product, very innovative one by named as SETUAN,” said Emi Yuniarti Rusadi, a socioeducopreneur in Yogyakarta. Furthermore, she explained, “You can use this product in various occasions, both for formal or informal atmosphere.” Based on the practicality, the set can also save some expenses. SETUAN team is one of the 25 groups of UMY which passed the selection to get funding from Dikti. The team will compete with the other groups from other great universities in Indonesia at Monev Dikti that will be held on 17-18 of July 2018 at Universitas Muhammadiyah of Yogyakarta.